Two troublesome species of wasps encountered by property owners are the northern paper wasp (which is dark brown and approx.5/8 inch long) and the slightly smaller European paper wasp. The European paper wasp (often confused with yellowjackets because of similar coloration) is an aggressive newcomer, which was first recorded right in Cambridge Massachusetts in the early 1980’s. Both species will nest in attics, beneath decks, shingles, and building overhangs but the European type is adept at nesting in all types of outdoor items from gas grills to play sets. Each year, people suffer serious medical complications and even death from hypersensitivity to wasp stings. 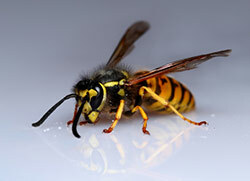 Yellowjackets are yet another stinging member of the social wasp family that causes headaches for homeowners. New England is home to many species, all of which are about 3 to 5/8 inch long, black and yellow in color. Yellowjackets do not make honey like bees, they prefer instead to hunt or scavenge for their food. Yellowjackets will nest mostly in old rodent burrows and are usually discovered the hard way by children playing too close or by accidentally mowing over their nest. Here they’ll build layers of comb completely enveloping them with paper and expanding the size as needed throughout the summer. Sometimes, yellowjackets will invade wall voids or nest between attic rafters in your home. Don’t risk your families health.